The UCSF Sialendoscopy and Salivary Duct Surgery Center is dedicated to offering individualized care with a focus on minimally invasive approaches to the salivary duct. 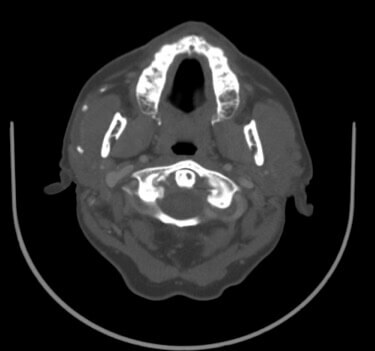 Each patient coming for consultation can expect a detailed analysis of his/her history, prior imaging (CT scan or MRI), a thorough head and neck exam, and often an ultrasound exam. Sialendoscopy, or salivary duct endoscopy, is a tool used to examine the salivary ducts of the parotid and submandibular glands. This procedure is performed for patients who notice recurrent swelling of the major salivary glands with eating. Salivary duct obstruction can occur from salivary duct stones (sialolithiasis), duct scarring (stenosis), inflammatory disorders of the salivary gland, or salivary gland tumors. Salivary duct endoscopes can be as small as 0.9mm in diameter and are used to examine the salivary ducts and assist in the removal of stones in the salivary ducts (pictured on a CT scan here).